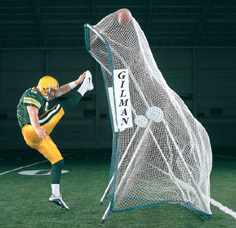 The FAIR CATCH™ is a sideline kicking net. Designed to catch the ball and not interfere with the kick. The pocket design lets a Kicker take his steps and get high leg elevation without snagging his cleats in the net. The frame is stable and balanced and won’t tip in the wind. The net is attached to the frame with Velcro. Setup is simply a matter of extending the legs and top bar. Breakdown is as easy as folding down the legs and top bar. Comes with a zippered travel bag. Open face of net measures 50" wide by 82" tall. "The coaching point is to get into a rhythm and feel the ball coming off your foot!"